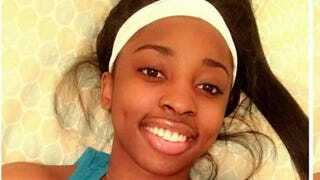 Despite several calls from protesters for a federal investigation into the death of Kenneka Jenkins, the Chicago teen who was found dead in a Rosemont, Ill., hotel freezer earlier this month, Rosemont police have made it exceedingly clear that that is not about to happen. As the Chicago Sun-Times notes, Jenkins’ death has highlighted the distrust of police in the Illinois suburb, most lately witnessed Monday night when protesters, chanting and clanging pots and pans, demanded that the FBI take over the investigation. Local police, however, squashed those complaints, insisting that they are doing all they can in the mysterious, rumor-laden case. “This investigation has been and remains the utmost priority for us,” Rosemont Police Chief Donald E. Stephens III said in a statement addressing the issue. “Throughout this investigation, we have used any and all outside agencies necessary to complete a thorough investigation and will continue to do so as needed. “I am fully confident in the ability of each and every one of the officers, detectives and leadership team charged with this case. At no time have I doubted the work that is being done,” he added. Rosemont police have stated that Jenkins’ death is currently being considered noncriminal and that there was “no credible evidence at this point” to classify the 19-year-old’s death as a murder. An initial autopsy on the teen was inconclusive. Jenkins’ body was discovered after an 11-hour search earlier this month in a freezer at the Crowne Plaza hotel in Rosemont, where authorities pronounced her dead, saying that she was beyond resuscitation. Authorities had initially said that Jenkins, who reportedly had been intoxicated, walked into the freezer. Her family, however, insisted that the story was suspicious. Facebook video soon emerged, prompting several social media rumors and theories about what happened to Jenkins that night, further feeding suspicions of foul play. Ultimately, police reviewed the Facebook video, also interviewing those seen in the video and saying that they would leave no stone unturned. The family and a community activist later had some fallout after the activist in question, Andrew Holmes, said that he viewed the video and that as far as he could see, Jenkins walked into the freezer of her own accord. Jenkins’ family immediately pushed back, saying that they were misrepresented by activists who called for the news conference at which Holmes spoke. It was later revealed that the family had “only been provided snippets of video, none of which shows Kenneka Jenkins walking into the freezer,” a family statement later read. Last Friday, Rosemont police released nine video clips showing Jenkins walking unsteadily through the hotel alone hours before her death. She can be seen walking down a hallway and through the hotel’s kitchen before disappearing. None of the footage that was released shows her actually going into the freezer.